Like raw or brown sugar, only better !! 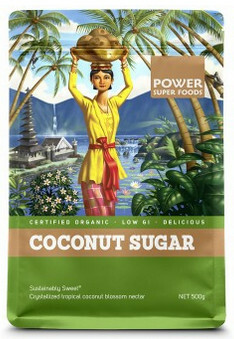 This sun-kissed sweetener is the crystallized nectar of the tropical coconut palm tree blossom, harvested high in the swaying canopy by traditional farmers, then evaporated and crushed into a unique, unbleached, not-too-sweet sugar alternative. So go ahead, indulge that sweet tooth !! Nutritional Benefits Boasting a naturally Low Glycemic Index (GI 35) that is nearly half the GI of cane sugar (GI 68) and lower than honey (GI 55) and even agave (GI 42)…….this super Polynesian food has the added bonus of a nutritional content richer than possibly all other commercially available sweeteners! Contains protein (12 amino acids) and comparatively high mineralization including potassium, magnesium, phosphorous, zinc and iron. Suggested Uses Replace 1:1 with cane sugar in your coffee/tea/chai/cocoa or homemade lemonade/iced tea. Alternatively, it's easily incorporated into all your favourite dessert recipes. To many indigenous island communities, the coconut sugar palm is known as the "Tree of Life" – this species (different than the Palm Oil tree) grows in diverse wild-life supportive agro-ecosystems, and can produce over 100 types of products from which farmers can earn a profitable, sustainable living. Producing 50 – 75% more sugar per acre than cane sugar while using less than 1/5th the nutrient resources, it must be the single most sustainable sweetener in the world! !